Bio Girl: Does Calling it my Blogiversary Show my Age? So today is my five year Blogiversary. Which is a term I haven't actually heard in about three years... so that alone may prove that I have been pouring out every thought that comes into my head for way too long now. It blows my mind. Truly. That I have continued to write, that you all have continued to read and comment. That five years later I still feel that pull to sit down here and tell our story. More than that, that five years later it now feels like a part of who I am. I am a writer. And it shocks me. It shocks me that I have been asked to write other places, that people trust me to review books and products, or bigger still, to be their voice on something as important as endometriosis. That they ask my opinions, that I am quoted in articles. That people enjoy what I write. Thank you for coming here several times a week to read. Thank you for your comments. They are the fuel that keeps me writing. Thank you for your support. This five years has brought on very difficult times for me and my family. But oh, they have brought amazing times too. So thank you for sharing them with me. For cheering me on, for holding me up, for crying along with me. This blog has become a part of me. And so have all of you. I know I sound sorta weepy and cheesy here, but really, thank you all. It means more than I can say. I don't ask often, but I would love it if you took a second and left a comment on this post. Just because your comments make me happy. And because it seems like five years is sorta a big deal. I mean, that's an entire hand, right? ** I spent about thirty minutes looking for a screen shot of what this blog used to look like. It was something special. You couldn't look directly at it or it would burn our your retinas. If I ever find it, I will be sure to share! **Missy had her appointment with the NIH this morning and the tumor is much smaller! We are so very thankful for answered prayers. I will post more details over on her blog later this afternoon or tomorrow once I get to talk to her and my parents. 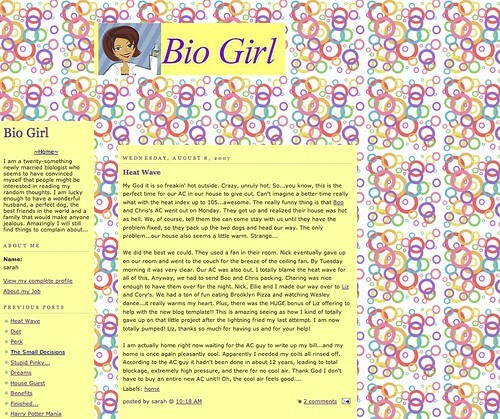 Thank GOD my cousin was able to track down the beauty that was my original blog design. Now don't be shocked or anything, but I DID THIS ALL BY MYSELF! I am so talented, right? That full open space on the right, the tiny header, the seizure inducing circles.... I totally missed my calling to become a graphic designer, right? Do you get presents for a Blogiversary??? You know I love reading your blog because we are so much alike. Funny, beautiful and excellent writers. And humble of course. Always humble. Oh of course, always so humble :) It's what our family is known for, right?? I've gotten so lazy at commenting but I am still here reading and enjoying the Henry pictures! Happy blogoversary! Congratulations on your blogaversary. Very impressive!!! Hello! Still reading and still enjoying. I don't comment often but my son was born the same month as Henry and it's fun to follow along your journey. Thanks for sharing so openly! You are the BEST! Both for finding the image and for fixing the design around here! Happy Five Year Blogoversary! Awesome! Have five years of blogging! I enjoy reading! My cousin actually did my current blog design and she had taken a screen shot of the original just for memories. I was lucky she kept it! Dude, it's a VERY big deal -- five years is a huge milestone. Congratulations. Not sure about your ability as a graphic designer, but I have no doubt as to your calling as a writer. Yours is one of, if not the, best written blogs in the blog-dom. Thank you for allowing us to share in the good times--and the not so good ones. Here's to many more years! Aw, Lori! You just made my entire week with this comment. Thank you so much! Happy (belated) Blogiversary! I haven't been reading your blog for long- just since this summer- but I love it. Thank you so much, sweet Mandy.